They failed miserably who vainly purposed to aggrandise their position by politicising Hajj; preventing Iranians from performing the pilgrimage, citing security concerns and advancing baseless allegations against the competence of Saudi authorities in handling Hajj affairs. In Iranian Pilgrims In Hajj 2016, published May 20, this year, on these pages, I chronicled the diplomatic tension between Iran and Saudi Arabia over the execution of Nimr Al Nimr on terrorism charges which led ‘angry mob of protesters’ to set ablaze Saudi’s ‘diplomatic missions in both Tehran and Mashhad’. As a result, the Kingdom of Saudi Arabia severed diplomatic ties with Iran. However, in line with the Kingdom’s policy of welcoming Allah’s guests, ‘irrespective of their nationalities and sectarian backgrounds’, Saudi Hajj authorities made a number of concessions to Iranian Hajj officials in order to facilitate the pilgrimage for their compatriots. They issued landing permits to Iranian aircrafts in spite of an existing ban imposed by the General Authority of Civil Aviation (GACA) at the time, and allowed Iranian pilgrims obtain Hajj visas through the Saudi Embassy in Dubai. Unfortunately, the Iranian Hajj officials insisted on having their visas issued in Iran even though Iranian mobs had recently torched both the Saudi Embassy and Consulate in Iran. Thus they failed to ratify agreements reached at the end of their four-day series of meetings with their Saudi counterparts ahead of the pilgrimage. Later on, Tehran, at the behest of its Supreme Leader, Ayatollah Ali Khamenei, unilaterally announced that its citizens would not participate in Hajj 2016. It did not matter whether the intending pilgrims had anything to do with the largely political tussle which led to the boycott or not. This severing of ties and subsequent boycotting of Hajj is reminiscent of what happened during the 1987 Hajj, which resulted in a clash between Shi’ah demonstrators and the Saudi security forces. That year, Iranian pilgrims had turned the pilgrimage into a rowdy theatre of politically influenced demonstrations with shoutings and denunciations of America, the Big Satan (I wonder what the wordings of the slogans will be today with the nuclear agreement led by Obama’s administration) and the state of Israel among others. ‘We don’t want Mushrikeen’ was oft-chanted by irate protesters in the city of Makkah, and in the same tone followed by ‘Labbaika, yaa Hussain’. The protesters carried flags and placards with bold inscriptions professing worship to other than Allah. Those who denounced Mushrikeen were at the same time uttering words of Shirk in rancorous processions under the pretext of observing Hajj. Allah forbids wrangling and angry conversation during Hajj (Qur’an 2, Al Baqarah: 197). Incongruity! Clearly, the irony was lost on them. On July 31, 1987 the Saudi police and National Guard personnel, as part of security measures, cordoned and sealed part of the planed demonstration route. 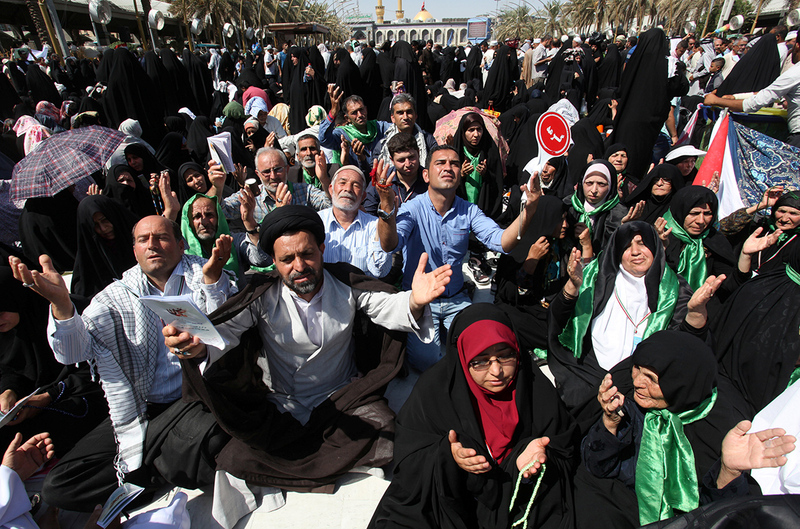 The Iranian demonstrators, who tried to force their way through the cordon, clashed with the security forces. This blatant disobedience of simple safety instructions at the peak of Hajj led to a crowd crush in which the following death toll was recorded: 275 Iranian pilgrims, 85 Saudi police, and 42 pilgrims from other nationalities. I am not saying the Saudi government is made up of saints; they have their own shortcomings. However, to imagine that the bigoted lot who currently run the affairs of Iran would be a better alternative to run the affairs of the Inviolable Places of Worship in Makkah and Madeenah is the height of naiveté. Why did Khamenei choose the festive Eid Day for the release of the above statement, on the busiest day of Hajj where the pilgrims have to leave Muzdalifah, to Minaa, to Makkah for stoning Aqabah, slaughtering of sacrificial animals, shaving, Tawaaful Ifaadah, etc? Was it to distract the pilgrims from their genuine devotions to Allah at a time when Iranians have gathered around the shrines of Imam Hussein and Imam Abbas in Karbala? Was it because political interests had preeminence over Muslims’ holy duties? Was it due to rapprochement with the United States of America, “the Big Satan”, over the agreement on nuclear programme, or was it a case of Tauheed and Shirk? Divergent opinions were expressed on the exact number of victims and cause of the crush, none of which, by the way, had anything to do with the fiction of the Iranians. However, Saudi Arabia’s response to the tragedy in terms of prompt medical aid within the scene and in various hospitals in the Kingdom was beyond question, and not susceptible to undermining from any quarters except that of the Mullas in Tehran. The evil augury of those who prevented their citizens from performing Hajj 2016 has fallen against them as Muslims have observed their ritual without incident. The absence of their pilgrims was not felt, and neither heaven nor earth shed a tear over them (Qur’an 44, Ad-Dukhaan: 29); they were not missed…. Hajj 2016 was most successful as many of the pilgrims obeyed the regulations of the Saudi Hajj authorities regarding movements within the holy monuments and observed timings for the Jamaraat rituals allotted to Hajj contingents; a rule that would have been defied, had the troublesome ones from Tehran shown up. Praise be to Allah who made us witness the orderliness and benefits of hitch-free pilgrimage, and to celebrate His Names in the way that He desired devoid of wrangling and shouting. In the absence of the votaries of the shrines in Karbala, Makkah did not behold demonstrations saturated with political slogans or altercations; Hajj devotions were performed for Allah only! Allahu Akbar! I have only thanks for Khamenei, who has helped relieve some of the artificial hassles of Hajj by reining in his people, thereby keeping others safe from their deliberate disobedience and its outcomes. Thank you Iran, please keep it up.